A trip to Malawi always has me experiencing wonderfully intense and impactful situations that I never forget. Often, I cannot pick one that stands out from the others on any particular trip. This past year was an exception. The most emotionally fulfilling experience for the year was a trip to a secondary school in the Dowa Valley to serve the girls in the most extraordinary way. Kathy Ruiter from Buena Vista, Colorado made contact with us and offered hygiene kits for the girls who generally miss 5 days of school a month due to lack of supplies for their menstrual cycle. Near that same time Arla Gabrielse, from Demotte, Indiana, was working with women in northern Indiana to prepare hygiene kits as well. The packs from both groups would be carried in our luggage on the trip to Malawi later in the year. Education in Malawi is difficult because of the lack of all supplies. Pencils, paper, books, rulers, chalk, are also in short supply. In fact, when it comes to the school’s everything is needed. Village children must often memorize everything since writing notes is impossible, for lack of supplies. Add to the struggle missing 5 days each month of classes. It is daunting for the girls. On last year’s trip two women, traveling to Malawi for their first trip, Rae Ann Messenger, Arla Gabrielse, and I addressed 80 girls from ages 10 to 18. I first asked the girls who had started menstruating to raise their hands. Not one hand went up. The stigma of menstruation is so pronounced that even with only women in the room they could not admit it. I next asked how many girls routinely missed 5 days of school each month. Every hand went up to this question. Easy for them to admit just missing school! I told them we had come to help them attend school every day. All hands shot up to receive the beautiful hand sewed backpacks, filled with handmade menstrual shields, 8 washable pads with soap and a zip-lock bag to clean them in and wash clothes to clean themselves. The excitement just grew and grew as they showed each other how pretty their pack was. They were so very proud of their bags and the life-changing girls supplies after singing songs of thankfulness, and gratitude to those who made them and to us who had the wonderful privilege to deliver them, they put on the backpacks and with joy and pride and confidence in themselves walked out the door to a brighter future. 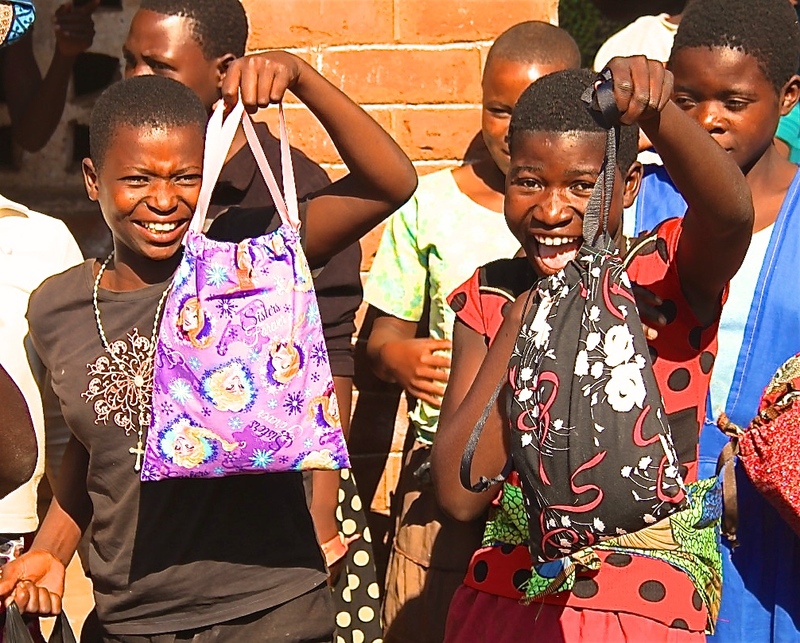 Malawi Project is very thankful to Kathy Ruiter, Days for Girls, and every woman who sent shields and pads. For me, there is nothing worse than the idea of being an empty-handed missionary. Because of you, I was most blessed to be able to give. That’s what keeps me going.